Street noise may be a valuable indicator for bicyclist safety, but no studies have evaluated the relationship to date. This study develops a method for evaluating street noise and documented crash rates for roadways in Austin, Texas, and Washington, D.C., in a manner that is replicable by researchers and practitioners. 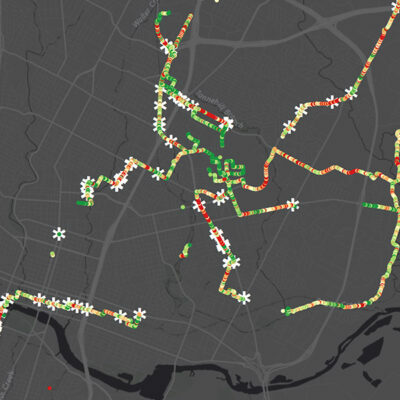 Researchers collect street-level noise in both cities over a range of locations, facility types, and times, and compare these against crash records, normalized by bicycle volumes, and other explanatory variables. Descriptive and inferential statistics of a pilot test suggest a role for street-level road noise impacts to vulnerable road user safety. If this full-scale examination in two cities show consistent results, street-level noise measurement—obtainable by non-experts—may offer time and cost savings relative to other street safety estimation methods for bicyclists. Street noise may be a valuable proxy for safety variables such as motorized vehicle speed, volumes, and proximity to bicyclists, which could result in improvements to facility design and crash modification factors to reduce bicycle crashes.